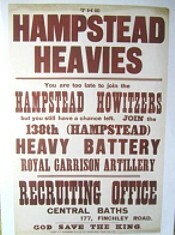 Recruiting poster for the Hampstead Heavies. Harold Graham Paris, born in Southampton, Hampshire on 13 October 1887; son of Alexander and Emma Paris; married Helen Margery Paine in 1915, grandfather of Sue Udy. 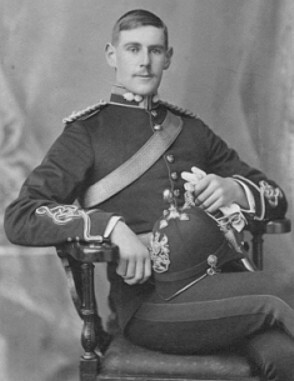 From school, he entered The Royal Military Academy at Woolwich in July 1905, being commissioned into the Royal Garrison Artillery on 23 July 1907. He then served for a time in Hong Kong before being sent to France on 19 August 1914, as a Lieutenant with 35th Heavy Battery, Royal Garrison Artillery. Following involvement in many battles, promotion and transfers to other units, he was promoted to Major and Officer Commanding of the 138th Heavy Battery in February 1917. He was awarded the Military Cross on 16th August 1917, “For conspicuous gallantry and devotion to duty in keeping his men in action under very heavy hostile shell fire, during which he worked at a gun himself, setting a splendid example to his men. A few days later he most skilfully withdrew his guns under a heavy bombardment, and he has on many previous occasions displayed great courage and fine leadership.” On 16th September 1918 he was awarded a Bar to the Military Cross, “For conspicuous gallantry and devotion to duty. This officer superintended the withdrawal of his guns under heavy fire, and largely owing to his efforts only one gun had to be abandoned. Earlier the same day he remained in the observation post, sending back information when his telephonists were severely wounded. Throughout the fighting he commanded his battery with skill and cheerfulness, keeping his men in good spirits.” Major Paris was killed during an enemy attack on their camp at Estrées on 6 October 1918. The following day, he was buried by his own men, in Hargicourt Military Cemetery. The 138th Heavy Battery, Royal Garrison Artillery, was formed in 1915 from volunteers in northwest London. Most of the Battery's initial training from October 1915 to March 1916 took place on Hampstead Heath and it soon became known as "The Hampstead Heavies". The Heavies, equipped with 60-pounder field guns, served in France and Flanders during the First World War, being on active service from April 1916 until November 1918. Of the 200 officers and men who landed in France with the original Battery, only 1 officer and about 30 other ranks were left at the Armistice. Much of this information was supplied by Major Paris’ granddaughter, Sue Udy, and the Highfield (www.highfieldhistory.co.uk) and Hampstead Heavies (http://hampstead-heavies.com ) websites.